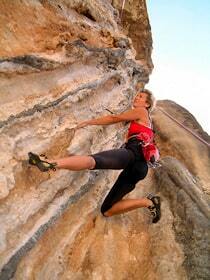 In spring and in fall some of our guides of Alpine School Arco will be in Greece on Kalymnos. At the moment we have suspended our activities on the Island because the local situation. It is a small Greek island which makes part of the Dodecanese archipelago in Greece. Kalymnos is located North of the well-known island of Kos, not far from Rhodes and the Turkish coast of Bodrum. Kalymnos' dimensions are ca. 25 x 10 km. In the past, the island has been famous for its sponge divers. The "normal" tourism is not invasive and the climbers have started to come here only since 1998. The best periods to come here are spring and fall. The summer is extremely hot and the likelihood of very strong and long-lasting winds is rather high. The climate is very mild and dry throughout the whole year. Rainy days are rare and mostly during winter-time. Languages spoken: English, Greek. Currency: EURO. Passport is necessary for non EU travellers, otherwise the identity card is enough. If in doubt, please check with your consulate or travel agency. You get there by plane to Athens from all major European and international airports. After the construction of the new airport, the most direct way to reach the Island is a domestic flight from Athens to Kalymnos Sometimes it is convenient book flights online with AEGEAN AIRLINES - OLYMPIC AIRLINES - RAYANAIR to Athens and Kos. From the harbour of Kos you take a ferryboat (ca. 40 min.). How to get around on the island: by scooter (with automatic gear) suitable for 2 people (please bring along your drivers license and wind-proof jacket) or by rent-a-car. (Cost for a scooter per day: ca. EUR 15 - 20; rent-a-car per day: ca. EUR 40 - 50). Depending on your flight schedule to Greece, it might be necessary to spend an extra night in Athens or on the island of Kos (not included in our offer). In this case we are able to provide you with useful information. There are some small hotels and only very few are open in the low season. The climbers are mostly staying in the so-called 'studios' which is the local name for a holiday flat. The studios are furnished with a small kitchen, private bathroom and a porch. Our local collaborators in Greece are the owners and managers of the studios which are available for 2 up to 3 persons. We can give you a hand with the reservation of a hotel room or the studios for 2-3 people and the scooter for the duration of our activity. The 'studios' are very nice and clean; the price is from 35 to 45 Euro per day. There are various small restaurants (taverna) where you can eat local and international food at very reasonable prices. The locals most of whom speak English, are very gentle and friendly towards the climbers. When God created Earth, at the end of his hard work, he remained with only some stones in this hands. As he was tired, God threw the stones into the Sea and in this way the island was born. Now the Greek inhabitants of the Island are claiming that God had created Kalymnos for climbing and trekking: it is really a scrambling paradise for everybody. From beginners to experts: everyone finds his suitable routes. Here is the ideal place for our instruction, guiding, personal tuition, courses and trekking: everywhere there are easy climbing routes on multicolor rocks, turquoise sea, blue sky, warm sun. The history of tourism is very recent. Only in 1996, an Italian climbers couple has discovered it as a climbers' paradise. Kalymnos offers a great number and variety of lime stone rocks with different kinds of difficulty degrees (overhangs, caves with stalactites, slabs...). At the moment there are about 50 crags with more than 1000 single pitch routes. There are also some multi-pitch routes available. During our last courses on Kalymnos Island, we have visited some sectors which have been just recently opened. In particular, we have climbed in those areas where there are almost only easy routes from 4 to 6a, also suitable for beginners. We have been climbing in recently opened sectors on fantastic and still "stinging" rocks with routes that sometimes exceed 30 metres. Wherever you are, you can enjoy the panorama, uncontaminated nature and the blue sea typical for Kalymnos. We recommend to wear long and technical climbing trousers both to avoid the pungent shrubs and to protect the knees. On the new, easy and sharp slabs, falling while leading is absolutely to be avoided. OUR OFFER INCLUDES A: 5-DAY- COURSE with an internationally licensed MOUNTAIN GUIDE (language: English, German, Italian), rent of the general technical material such as rope, quickdraws, carabiners. Kalymnos is best known as the island of some of the word' s finest sponge divers. The sea has always been a focal element in the local life, which has preserved its traditional character colour and style to a great extent - nowadays Kalymnos island is part of a protected National Marine Park. Most of the beaches are rocky and you will find crystal clear turquoise water. The normal tourism on Kalymnos is rather limited. The water temperature in the periods which we are offering is between 18 degree C. in spring and around 22 degree C. in fall. We recommend to bring a light wetsuit (3-5 mm), fins and mask. We especially recommend a visit of the wild Island of Telendos where the new rock climbing crags, the crystal clear water of the sea and the white gravel beaches fulfill the concept of climbing and sea.